1. With the Ski Walking Poles strapped on, the fingers super loose and relaxed (don’t squeeze the pole grips), the arms relaxed and down at your side and the poles angled back, start walking without even moving your arms – just let them hang straight down. Allow the walking pole tips to drag along the ground behind you. Don’t bend your arms. Keep your chin up and stand tall. *Try this for 10-20 feet. 2. Now, start to swing your arms – just like you would while casually walking. Continue to let the rubber pole tips drag behind. Keep the fingers super loose. When your right foot comes forward, so does your left hand – alternating. Keep your chin up and stand tall. *Try this for 20-30 feet. 3. Now, start to bend your elbow – the elbow is a hinge. Continue as you would while casually walking – slightly bending your elbow and straightening it back out. When your left foot comes forward, so does your right hand – alternating. Keep your chin up and stand tall. *Continue until you get the alternating down. Don’t feel bad if your left pole keeps moving in conjunction with your left foot – it may take some practice to correct this. You may have to revert back to #1 and #2 above. 4. Fantastic! Keep those fingers really relaxed, chin up, stand tall, poles angled back, and start to push back on the poles by using the strap – don’t grip the pole, apply pressure from the heel of your hand into the cradle of the straps to help push and propel you along. Feel the pressure from the heel of your hand. You should feel the pushing starting to work your arms. There is no need to drag the poles – I tell the skiers that I coach to pretend they are poking Snow Snakes. 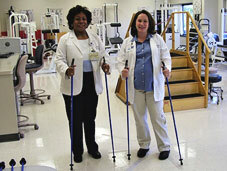 It won’t hurt the walking poles to push down on the rubber or metal tips forcefully. Rubber tips for hard surfaces. Metal tips for off-road and off pavement. *Take as much time as you need with this one- 100 feet or around the block. If you get out of sync, go back and practice #1, #2 and #3 above. 5. Great! You are now ready to take full advantage of the straps (don’t statically squeeze the poles – keep the fingers relaxed) and stop dragging the rubber tips on the ground. Guiding the poles with just one finger is okay. Start lifting the pole tips off the ground after each pole plant. The lead pole never goes further ahead than the opposing lead foot’s heel. And the poles are always slightly angled back behind you. The motion is NOT out in front (except for added balance when negotiating a log, the curb, ice patch, steep downhill, ………). Remember – keep the rubber tips or metal tips behind you as the poles are always angled back behind you. DON’T squeeze the poles! Feel free to guide the poles with your little finger or index finger. *Individuals with balance issues should keep their poles straight up and down at all times to help improve balance and stability. 6. Awesome! Keep practicing, and when you are ready, it is time to learn about The American Nordic Walking System’s Three Levels of Nordic Walking. You should be on auto-pilot! Keep up the good work and remember to keep your chin up, back super straight, fingers loose and relaxed. Please call or email with any questions, suggestions and/or comments. Have FUN! *Nordic Walking, Fitness Walking, Hiking and Trekking with poles are all done with the poles angled back behind you. Of course, the rules change in challenging terrain. The goal is to always keep your chin up, back super straight, fingers loose and relaxed. It is time to tackle the Three Levels of Nordic Walking.